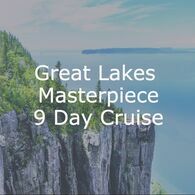 The Magical Lake Michigan Cruise from Blount Small Ship Adventures offers a deep exploration of Lake Michigan's beautiful coastline, circumnavigating the lake in 8 days. Embark from Chicago, home of the Michigan Mile, and head for Lake Michigan's beautiful eastern shore. 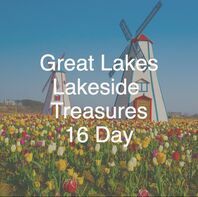 A stop in Holland, Michigan introduces you to the region's Dutch heritage, and a day's sailing takes you to the Victorian delights of Mackinac Island. Heading to the western shore, you'll visit Wisconsin's famous Door County, home to cherry orchards and Friday fish boils. 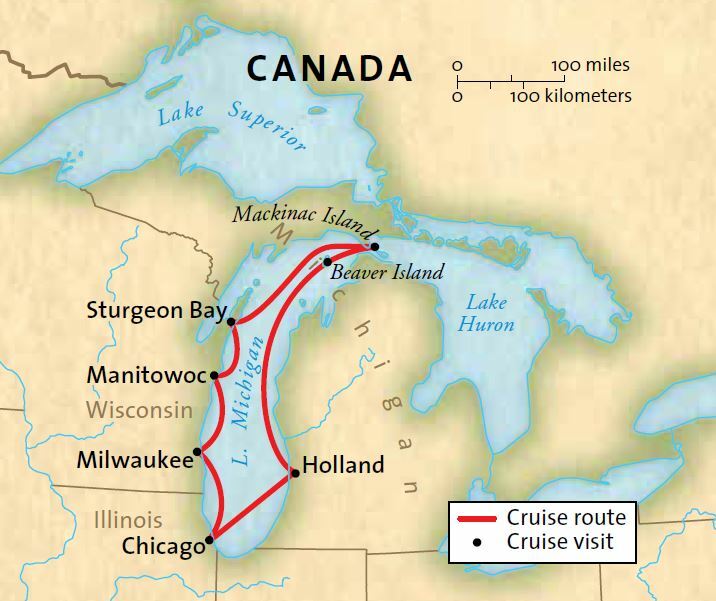 Explore the maritime history of the Great Lakes at Manitowoc with a visit to the Wisconsin Maritime Museum, then make your way south to Milwaukee, where breweries, baseball, and beautiful lakeside vistas help you make the most of your in-depth tour of Lake Michigan. Situated at the mouth of the Chicago River, on the southern coast of Lake Michigan, Chicago is a city of art, music, and industry. After breakfast, disembark and choose your adventure in Chi town. Visit the Michigan Mile or get to know the city's rich architectural history with a river boat tour. With shopping, museums, dining, music and theater, there's something for every taste in this iconic American city. Holland was founded in 1847 by Dutch immigrants and remains a testament to Michigan's Dutch culture. In spring, the area is covered by rows of beautiful tulips. At Windmill Island, artisans operate working windmills and craft authentic Dutch ceramics in the quaint village. Along the coast, colorful lighthouses dot the wind-swept dunes. Beaver Island is the largest island on Lake Michigan, but has a very small year-round population: only 600 Michiganers live out the winter here. In summer, the island lends itself to a leisurely pace. Tour the island by foot or bicycle, with over 100 miles of trails to explore. For a more relaxing day, soak up some sun on the beach or take advantage of some of the best fishing on the Great Lakes. The island offers stunning stargazing, far from the bright lights of large metro areas. Door County, Wisconsin is known for its extraordinary natural beauty, maritime traditions and charming art scene. From glass-blowing to quilt making, artists have been drawn to this corner of Wisconsin since the early 20th century. Sturgeon Bay offers a glimpse into the region's listing maritime history at the Door County Maritime Museum. The area's cherry orchards beautiful the landscape and make it "the Cherry Capital of the World." Manitowoc played a critical role in World War II, serving as the construction site for US Navy submarines. Your visit explores this extraordinary local history at the Wisconsin Maritime Museum. Learn about the critical role played by US submarines in the war, and explore a restored World War II submarine--the USS Cobia--from top to bottom. 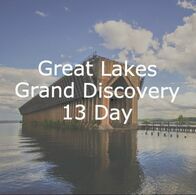 Wander the streets of a reconstructed 1840s town to get a sense of the region's proud tradition of Great Lakes shipbuilders. Milwaukee is known for its beers and its baseball, but this Great Lakes port has even more to offer. Explore downtown's Historic Third Ward, the city's arts and fashion district and home of the Milwaukee Public Market. Take a stroll along the Riverwalk and soak up this unique waterfront neighborhood. The Milwaukee Art Museum is only steps away from the ship's dock. In the evening, don’t miss the closure of its 217-foot Burke Brise Soleil. 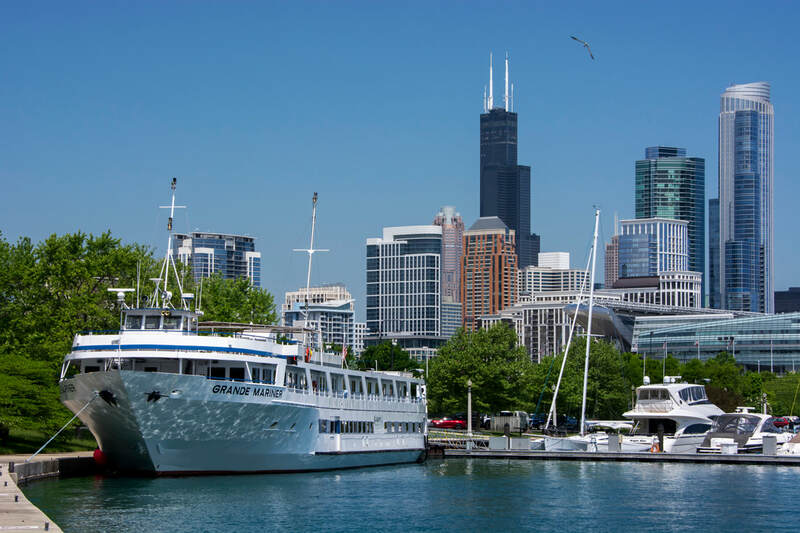 Disembark in Chicago, Illinois and consider an optional tour to say farewell to Lake Michigan from its most famous city. A farewell dinner celebrates the end of your journey around this magnificent Great Lake.